On January 2018 we had a vertical tasting of 12 Vintage Ports from the port wine house Delaforce. The tasting was held in Malmö, Sweden, in the wine society 18% celebrating 25 years in 2018. The house of Delaforce is since 2009 owned by Silva Reis and is thereby connected to Real Companhia Velha. The tasted wines were of course older than that and the oldest, Vintage 1963, is from the time when Delaforce was still owned by the family. The company has since then been owned by IDV, International Distillers and Vintners (part of the Grand Metropolitan Group) and Taylor, before it was sold to Real Companhia Velha in 2009. The older wines, on to 1977 and to some extent the 1985 Vintage, were made in a rich powerful style. These also got the highest scores. From the 1987 Vintage and through the 90’s the wines are made in a lighter style. This can be explained by the partnership with Croft, which was also part of IDV, and their ambition in the 80’s and 90’s to make Vintage Ports that would mature quicker. Luckily the youngest wines we tasted showed that this might no longer be the case, they showed a different structure with more body and tannic style compared to the wines from the 90’s and late 80’s. Even if Delaforce is not recognized as a top producer, the older wines from the 60’s and 70’s can be well worth looking out for. And even if we did not reach any top scores on the wines from late 80’s and through the 90’s, all wines are still drinking well, even if some of them are peaking today. Please read all our tasting notes and ranks here. 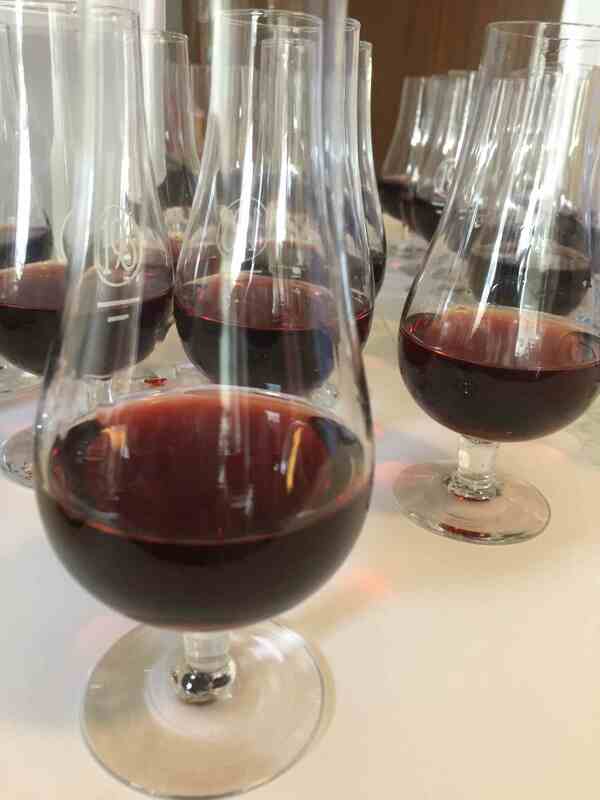 This entry was posted in Tasted Vintage Port and tagged 18%, Delaforce, Great Tasting, Vintage Port on February 28, 2018 by Stefan. Just before summer we held a private tasting of Vintage Ports from the quite new port house Miguels. Messias Miguel Valente, the owner of this house is related on his mother´s side to Messias Baptista who founded the house of Messias in 1926. After working several years at Messias, Miguel decided to create his own brand, Miguels in 2015. So if you haven’t heard about the producer before, there is a reason. Currently all Vintage Ports of Miguels are sourced from the Messias family stock. Miguels can therefore offer older Vintages as well, actually all the way back to 1960. In the tasting we had almost all currently available Vintages from Miguels, only 2005 was missing (and 1965, but this is not available anymore). It was very interesting to taste all of these at once, and there is for sure a consistent style, sweet with dried fruit, toffee, prunes and orange zest found in many of them. They also showed a quite distinguished acidity, especially in some of the older vintages. The winner, in the tasting group of 14 persons, was quite surprisingly the 1979 Vintage which was very generous on the nose and had a mature very balanced and elegant finish. Please see here for full tasting notes and points. This entry was posted in Tasted Vintage Port, Wine tasting and tagged Great Tasting, Messias, Messias Miguel Valente, Miguels on July 25, 2017 by Stefan. The Wine Society 18%, Malmö Sweden, had a Great Tasting on the 16th and 18th March 2017 of 31 different 1983 Vintage Ports. As always for these Great Tastings the expectations were high, especially for a Vintage like 1983 that has been praised by wine critics and experts. To be honest, this time the truth did not meet our expectations. There were too many wines that were over the hill and showed volatile acidity or oxidation. Unfortunately there were also some that we classified as defect due to bad corks. We have had several other Great Tastings of older Vintages but we have never had so many bad or poor wines. On the other hand some of the wines are really good, you just need to know which they are, and avoid the others. As always both Taylor and Fonseca are good, even if some in the group did not fully appreciate the Fonseca. Both are quite mature, the Taylor looks surprisingly light in colour but it is as always very generous in the bouquet and wonderfully delicate on the palate with raisins, orange zest, dark chocolate and cacao. It is a full bodied wine and has a long attractive finish. Some of the absolute best wines from the Vintage are from the Symington’s. When looking at the total ranking from the total tasting group they actually took the four top places! The top scorer of the night was Quarles Harris followed by Gould Campbell, Grahams and then Smith Woodhouse. The Quarles Harris is still quite dark in colour but with a mature yellow rim. It shows all the attributes of a Vintage Port on its peak, with coffee, tea, cacao and much more in the bouquet, On the palate the wine seems to remain forever in the mouth – truly a perfectly balanced port wine. Please read all of the tasting notes and all our scores and ranking under Great Tasting 1983. This entry was posted in Tasted Vintage Port and tagged 1983, Gould Campbell, Graham, Great Tasting, Quarles Harris, Smith Woodhouse, Taylor on May 2, 2017 by Stefan. 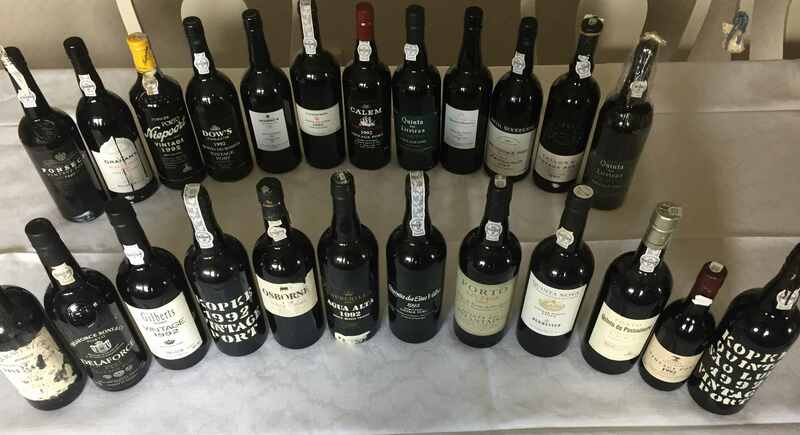 Our wine club ‘The Wine Society 18%’ celebrates its 23rd anniversary this year and we have during these 23 years tasted quite a lot of vintage port. It has been altogether 612 different vintage ports ranging from 1873 to 1999 and of course we have tasted a lot from the 21st century too. 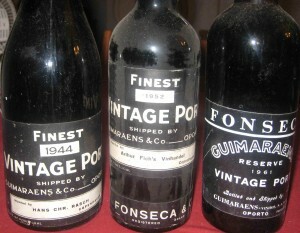 Unfortunately we have only tasted 3 vintage ports from the 19th century. We are 15 members and have 5 meetings every year and then some extra now and then. As we are only 15 members, we can have quite rare bottles i.e. 1 bottle is enough. The meetings are in Malmö, Sweden. In November every year we have a Great Tasting of either a Vintage or a House. We have so far tasted 1947 (semi-Great), 1960, 1963 (twice), 1966, 1970, 1975, 1977, 1978, 1979, 1980, 1982, 1984 (semi-Great) and once also just a House which was Cockburn from 18 different vintages from 1904 to 1994. This year we wanted to do a new house tasting, even if this is much more difficult than a vintage tasting. Still we were lucky enough to find quite a lot of Guimaraens, so we enjoyed 18 different 20th century Vintages from Guimaraens in the range 1944-1998. Please read all details, including tasting notes and ratings here. This entry was posted in Tasted Vintage Port, Uncategorized and tagged Fonseca Guimaraens, Great Tasting on December 23, 2015 by Stefan. We thank you for a wonderful and, for us, inspiring year with now more than 55.000 visitors from more than 130 countries. It has been very stimulating for us. Please read about our Great Tasting of the magnificent vintage year 1963. They are still wonderful to drink and enjoy. Some are maybe a little old but the best are marvelous. This is the second time we have a 1963 tasting and this time we had only 38 houses, but in 2005 we had 39 houses. Both tastings included a joker which was Quinta do Noval Nacional 1962 and both times it was Best in Show! Marvelous! As usual we had an interesting Christmas Tasting in the Wine Society 18% and especially the comparison between 1976 Fonseca Guimaraens and Malvedos was worth-wile. Guimaraens is still very young, incredibly dark in colour, and we think this will be better with some more years in the cellar, but the Malvedos is wonderful today, much paler in colour and fully matured, maybe even a little old. Very interesting and a quite good vintage. Christmas the whole family spent in London and we did of course eat in some really marvelous restaurants and we also got the chance to taste a lot of Vintage Ports. This entry was posted in Uncategorized and tagged 1963, 1976, Great Tasting on January 2, 2014 by Stefan.